Silicone Soul ‎– Right On! Comes in a generic black spined sleeve with cutouts on both sides, exposing the record's labels. Released under exclusive license by Zomba Records. Made in Germany. Side A listed as "Right On! 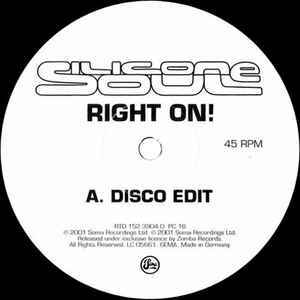 (Disco Edit)"
Side B listed as "Right On! (Instrumental)"